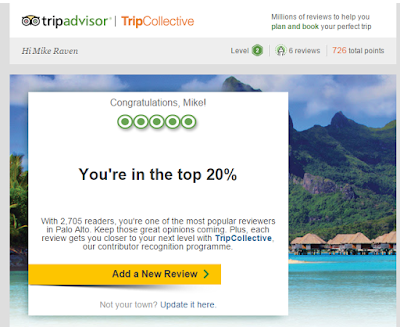 Today I got an email from TripAdvisor, thanking me for being one of the most popular reviewers in Palo Alto, the Californian city between San Francisco and San Jose, and birthplace of Silicon Valley. 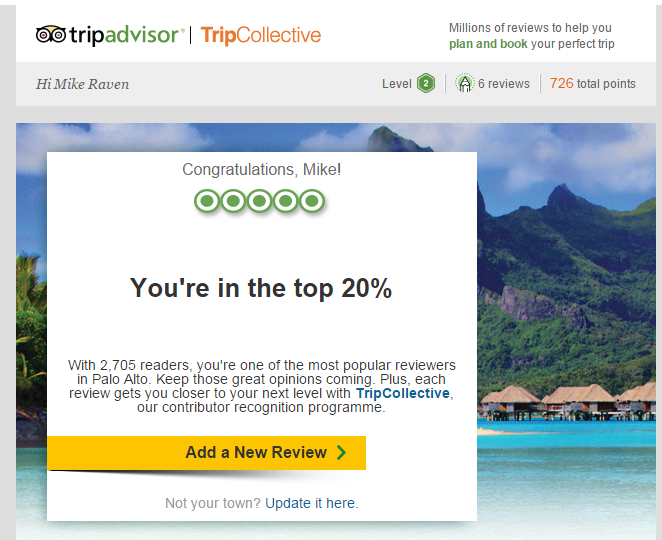 Apparently I've got 2,705 readers! Interesting really, because I've never been to Palo Alto, and I've contributed a total of 6 reviews and 19 ratings to TripAdvisor, almost all of them about places in Yorkshire in the UK (excluding the rating of a magic museum in Norfolk and a Benito's Hat joint in London, which is the best place in the world for burritos - says the man who has never visited Mexico! ), so all I can assume is that thousands of Silicon Valley workers, tired of the Mediterranean climate and the Digital DNA sculpture, decided to descend upon Hull and try out the delights of venues such as Pave (which is awesome). All I can say is Welcome to Hull guys, we've been waiting for you. And don't forget to take some chip spice away with you. So what is your recommendation for restaurants in Palo Alto?